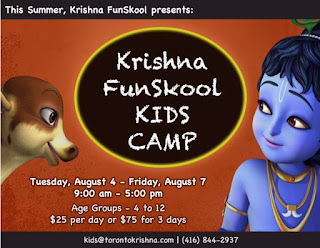 Krishna FunSkool Summer Kids Camp: August 4 - August 7 ~ The Toronto Hare Krishna Temple! annual Summer Kids Camp, which is happening this year from August 4-7th (Tuesday - Friday every day). You can register for any number of days! As always we have lots of fun activities planned out with sumptuous prasadam (vegetarian meansl) for all the children. The registration is $25 per day or $75 for all 4 days. You can pre-register your child by emailing us at kids@torontokrishna.com or by clicking here for the registration form.